Speaking of grilling, I have a funny grill story for you. When we moved from our apartment in Colorado to our house in Colorado last year, we decided to finally buy a grill. So we did. We found a used propane grill on Craigslist and went to go pick her up. Then we got it home and cleaned it up, and Clark gave it a fresh coat of paint. It was basically a brand new grill – complete with a full propane tank – for $25. SCORE. We grilled corn and zucchini and sweet potatoes and burgers and cabbage and tofu. Oh, and then we sold it right before we moved to Indiana for $50. Double score. 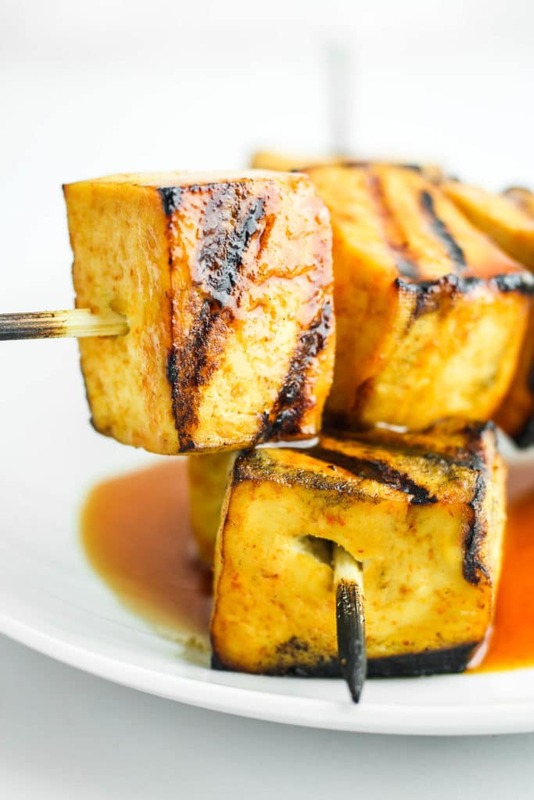 After we perfected these grilled tofu burgers last summer, we realized tofu on the grill was going to be happening a lot more often. It’s less expensive than meat, it can be seasoned any which way, it’s quick to grill, AND it pairs with veggies, salads, mac & cheese, and everything in between. 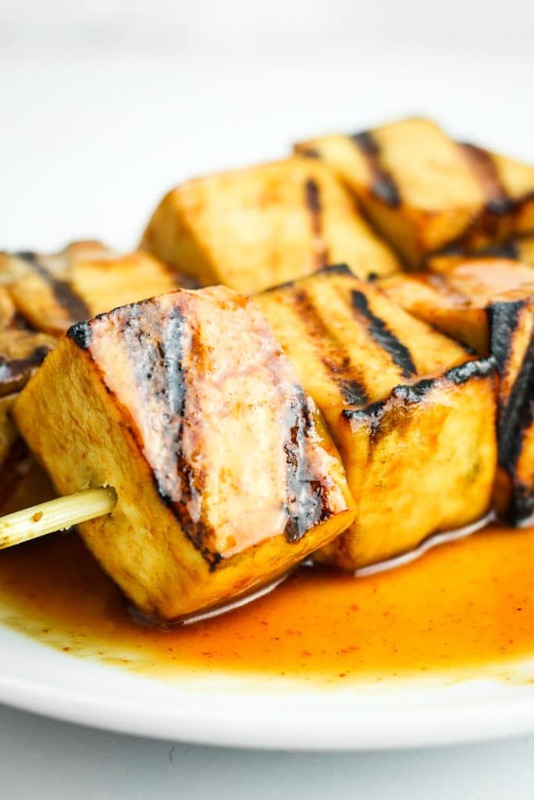 This sweet and spicy grilled tofu couldn’t be easier to make. 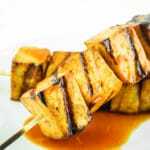 It’s coated in a quick mason jar concoction of sriracha, soy sauce, and maple syrup, then it marinates for 30 minutes (or longer if desired.) 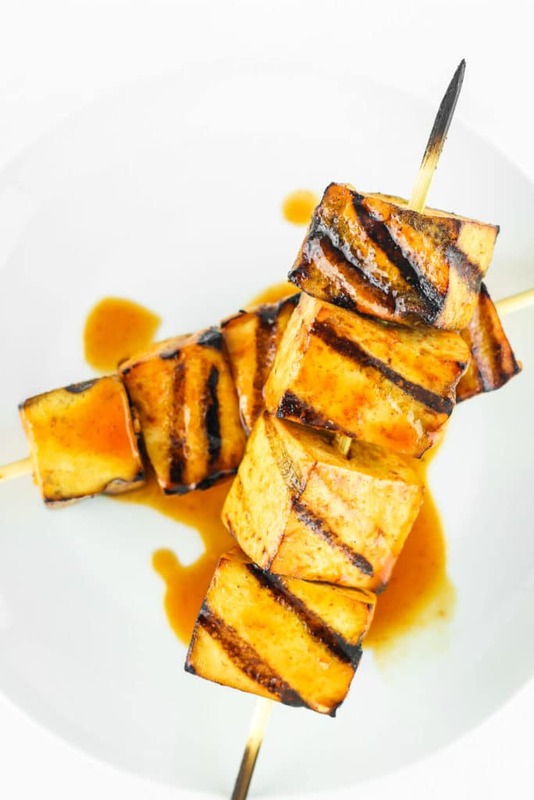 Skewer it up and toss it on the grill for 15-20 minutes and you’re done! Speaking of skewers, we usually use our favorite metal ones but those have yet to be uncovered after moving. We prefer those because the handles stay cool (meaning you can eat sooner), they’re sturdier than bamboo, and they’re reusable! You’re gonna make this ASAP, right? I thought so. Tell me all about it – I love sharing your creations on Instagram!